Mix vinegar and honey. Add oil. 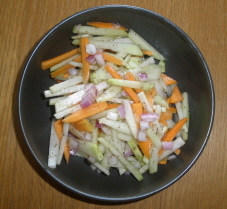 Add kohlrabi, carrot, and red onion to dressing. Salt and Pepper to taste. Toss well. Let stand 20 minutes. Re-toss, serve, and enjoy.